Hyundai India is fully owned subsidiary of the South Korean automobile manufacturing giant, Hyundai Motor Company. This reputed automaker entered the Indian car bazaar in year, 1996 and since then has been bringing in one better vehicle than the other for the Indian car enthusiasts. They are said to be one of the leading auto manufacturers standing on the second position in the country in terms of manufacturing and selling incredible vehicles and have a formidable fleet of automobiles in their stable. The company has their manufacturing and assembling facilities located in Sriperumbudur, Tamil Nadu and this massive facility has the capacity to manufacture close to 6,30,000 units in a year, which is quite incredible. This reputed car maker has a small hatchback called Hyundai EON, which is one of their most impressive and top selling vehicles. This hatch is available with petrol as well as a combination of LPG and petrol engine as well, which is called as the ‘blue drive’ and has quite a number of benefits to it. The petrol engine based Hyundai EON has five trims; while the LPG and petrol engine based combination variant has three trims for the customers to choose from. The entry level trim of this impressive hatchback is Hyundai EON D Lite and it has a balanced combination of striking exterior features along with other safety and comfort aspects integrated in it. The company has fitted an 814cc petrol engine in this hatchback that has a single overhead camshaft and is skillfully mated with a five speed manual transmission gear box. Some of the exciting and utility based comfort aspects that are integrated in this Hyundai EON D Lite are dual tone interior scheme, bucket type single unit front seats, an exclusive pedestal space, dashboard storage and many more such features. Then this small hatchback also has quite a few essential safety features such as a reinforced body structure, front and rear seat belts, an engine immobilizer and many more such vital features. The exteriors of this base variant hatchback, Hyundai EON D Lite have been done up astutely and has quite a few remarkable features, which will definitely impress the buyers. The front fascia is outstanding with a neatly designed front radiator grille that has some chrome treatment on it as well along with a large crest of the company embedded on it. This front grille is surrounded by a bright head light cluster, which has been fitted with high intensity clear lamps that help the driver to get a clear vision. The front bumper has a wide air dam in the center, which helps to cool the engine faster. The front wind screen is quite wide and has been fitted with a pair of intermittent wipers and also has a wash function. The side profile has black colored door handles and also a singular driver side outside rear view mirror. The neatly carved out wheel arches of this Hyundai EON D Lite has been fitted with a set of sturdy steel wheels of 12 inches. These wheels are covered with robust tubeless radial tyres of size 145/80 R 12 , which have a superior road grip on any terrain. The company has also given a standard spare wheel, which is fitted in the boot compartment of this small hatchback and it is a regular feature across all the variants of this vehicle. The rear end gets a rear wind screen that is flanked by a bright tail lamp cluster, which has clear lamps affixed in it and also an integrated spoiler as well that is making this small hatchback look sportier. All these striking exterior features make this Hyundai EON D Lite look attractive and very convenient. The overall dimensions of this small hatchback are rather liberal and it also has ample legroom along with good shoulder and head space. The total length of this Hyundai EON D Lite is about 3495mm, while the overall width of this hatchback is 1550mm, which also includes the external rear view mirrors. Then the total height of this small hatch is close to 1500mm and it also has a spacious wheel base of 2380mm, which is pretty good for a small car. This Hyundai EON D Lite has a minimum ground clearance of 170mm and it also has a centrally mounted fuel tank that can take in approximately 32 litres of petrol. The boot space of this small hatchback can accommodate 215 litres of luggage, which can be further increased by folding the rear seat. This small hatchback is being sold in quite a few vivacious and refreshing metallic exterior paint options. The list includes a sparkling Coral White metallic finish, a subtle and refined Sleek Silver metallic option, a dapper looking Mushroom metallic finish, a graceful looking Ember Grey metallic option, a vibrant looking Pristine Blue metallic finish and also a regal Maharajah Red metallic finish. All these exterior paint options make this small hatchback look smooth and lustrous. This trim is the entry level variant and the company has done up its interiors quite nicely and the insides have a refreshing look to it. The seating arrangement is quite good and it can accommodate five regular passengers in it. The seats are covered with good quality fabric upholstery, while the interior color scheme is a dual tone beige and brown key color. Then there are the B and C pillar trims, a deluxe floor console, an exclusive pedestal space with storage options like a large glove box and other dashboard storage for keeping some smaller things at hand. This trim also has bucket type single unit front seats and bench folding type rear seats. This small hatchback also has floor console storage, a cup holder, three assist grips and many more such features. This small hatchback has been housed with a performance packed 814cc petrol engine that has three cylinders and nine valves affixed in it . This peppy petrol train has also has an efficient fuel supply system along with a SOHC (single over head cam shaft) for better performance. This impressive petrol drive train has the capacity to generate a peak power output of 54.88 Bhp at 5500 Rpm in combination with a maximum torque yield of 74.53 Nm at 4000 Rpm, which is pretty good. This 814cc petrol engine has been skillfully coupled with a smooth and efficient five speed manual transmission gear box for better gear shifts . The company claims that this admirable Hyundai EON D Lite has the ability to generate a mileage of approximately 21.1 kmpl under standard driving conditions, which is rather impressive. This mileage has been tested by reputed testing agencies in the country and is quite credible. This energetic petrol engine has the ability to attain a top speed in the range of 130 to 135 kmph, which is rather impressive for such a small car. On the other hand, this lively engine has the ability to propel this Hyundai EON D Lite from 0 – 100 kmph in about 21.1 seconds, which is quite good . The company has bestowed this charming small hatchback¸ Hyundai EON D Lite with a proficient braking system and a competent suspension system, which is rather steadfast and very reliable. The front tyres of this hatch have been fitted with disc brakes, while the rear tyres get solid drum type brakes for improved braking efficiency. On the other hand, the company has fitted the front axle of this small hatchback with a McPherson Strut type of a mechanism along with a coil spring and also an anti roll bar for improved stability. Alternatively, the rear axle has been equipped with a tough torsion beam axle along with a similar coil spring that is fitted in the front axle as well. This small hatchback has also been equipped with gas type shock absorbers for all the tyres for enhanced steadiness on any landscape. 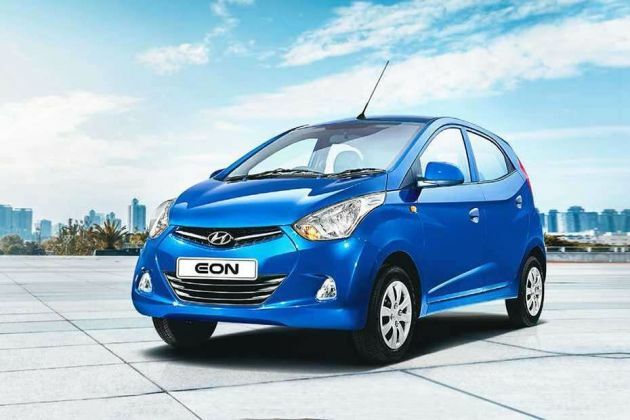 This trim is the entry level variant in the Hyundai EON model lineup and the company has included a few very important and crucial safety features in it. These features enhance the safety and security of the passengers as well as the vehicle . The list includes an internal rear view mirror for better handling and a very responsive steering wheel as well. This Hyundai EON D Lite hatchback also gets a reinforced body structure, front and rear seat belts for the safety of all the occupants, a highly advanced engine immobilizer and child safety rear door locks along with a few other features, which ensure protection and better handling of this impressive small hatchback. The company has blessed this base variant hatchback with quite a number of comfort and utility features, which will certainly impress the buyers. This Hyundai EON D Lite hatchback has a very receptive two spoke steering wheel that makes it very simple to handle this car in any traffic condition. This hatchback also has a brilliant instrument cluster, which has quite a number of varied and important notification lamps such as a dual trip meter, a low fuel warning lamp, a graphic band fuel gauge, a gear shift indicator , a remote boot lid as well as a remote fuel lid filler release and also a rear seat belt knuckle holder and a few other functions as well. With all such impressive features and striking exteriors, this small hatchback seems to be all set to rule its segment in the country’s car market. Pros :Good mileage, easy to drive in heavy traffic, peppy engine with good pickup. Cons :Quite a few interior features can be added, leg room less for taller passengers, luggage compartment is rather small. Hyundai EON is available in 5 different colours - Star Dust, Fiery Red, Pristine Blue, Sleek Silver, Polar White.